MIXING MECHANISM: Paddle type blades welded to the main shaft provide for efficient mixing of thick heavy material. PTFE gland mechanism provided at shaft ends prevents ingress of external powder into the trough and prevents leakage. CHARGING: From the top charging can be done through a hinge able lid, hopper or Nozzle can be provided for additional spraying of additives. DISCHARGE: By bottom discharge or by tilting and scraping or slide Iris or Butterfly valve of suitable diameter, for regulated discharge. 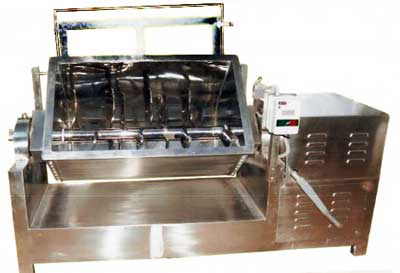 Note: Models for large scale, Small Scale, and Lab Size U type or Mass mixer to suit as per material mixing requirement are also available. Motor mounting and direction can be made as per client requirement. All contact parts can be easily and quickly dismantled and cleaned. Machine is designed for continuous operation. Flame proof electrical can be provided at extra cost. Material Charging auto screw feeders are also available.